Architectural designing are getting a good taste of improvement in the structural designing industry with the advancement in Revit. Revit makes an easy task for the designing procedure, coordination and collaboration with every small element by integrating all information in single platform software and giving access to all possible combinations. Revit designing procedure giving virtual development of the project before any ground implementation. Following reasons are the motivation for the investors. Revit has the capacity of complete ten times of work which will be done by AutoCAD at the same time. While the CAD system only design some 2D or 3D types design, where the Revit designing algorithm implements an intelligent type of design, looks like original final project implementation. This system connects to a database which will help in every possible way to generate a better design. If any changes occurred in any part of the design all other respective changes made automatically. There is a way for CAD to Revit conversion which will introduce the project in better perspective. If the site plan in the DWG file, import the file in Revit drawing. Need to be fully exploded. There should not be any unbroken block which will not be editable. Selecting the lines and layers workers changes it to the Revit line system. Also it can be done by selecting all the lines and then apply remap styles like thin, medium, wide, hidden etc. according to the requirement. The same procedure can be followed for text and documentation also. Copy pastes the whole system into a new Revit file. Sketch to Revit design conversion upgrades the working model from inaccuracies to accuracy. Sketch model can be consist of inaccuracy such as co-planar faces, vertical and horizontal approach, 3D polyline etc. which will completely eliminate in Revit designing pattern. When anybody is appointed for this type of conversion they need to keep in mind about exploding 3D data, parameters, visibility, two sided surfaces, sketch up properties, cut planes, sketch up and massing and scaling. Developers require a clear idea about the sketch and Revit model designing and proper knowledge of geometry. There is a collection of companies depending upon the outsourcing technique. The companies’ deals with various types of outsourcing design product. 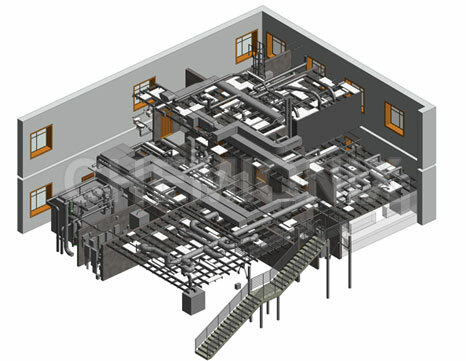 The Revit conversion outsourcing company gets the order from various customers from all over the world. Depending upon the clients’ requirement they deliver their project within the given deadline. The company workers repeatedly consult with the customers until they are not satisfied with their work and serve the best product with a satisfactory cost. Among the top level solution providers in Revit conversion services still now Chemionix holding their well-known position. Chemionix is an India based company situated in Mumbai basically deals with the outsourcing of CAD design and Engineering services. Teams of this company receive the AutoCAD files , PDF or image file format from the ordering customers and build up the efficient Revit models following the project details. Revit Architectural, MEP and Structural models are satisfying the customers’ need always.